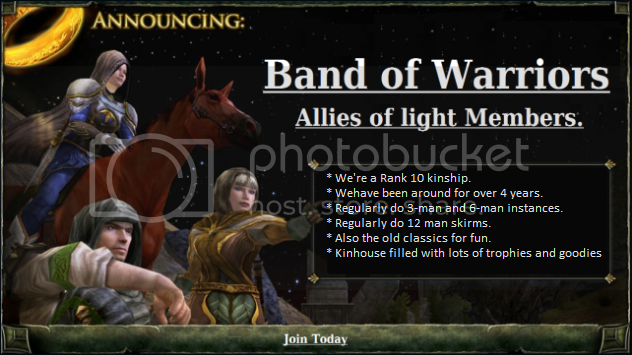 Band of Warriors Reborn - Your New Band of Warriors site! The Band Of Warriors Site! Everyone seems to be hiring nowadays, so what makes us different? Well here at Band of Warriors we are all about having fun whilst getting things done. We're a Rank 10 kinship. We have been around for over 4 years. Regularly do 3-man and 6-man instances. Do Regular 12 man skirms, RoI and old classic raids. Kinhouse filled with lots of trophies and goodies for all classes. What about our members?! I hear you ask. Well all our member's are friendly, helpful and relaxed. Our kinship is made up from people all over the world, of various ages, races and level of players. Some of us have been here since the game the began and others joined just this week. Over the time of 4 years, of course we have collected many trophies from many various and victorious battles, and we have proudly put on display in our Kin House. We have recently joined forces with the famous Allies of Light. This gives us access to more Raids, instances and back up for harder quests or when we are simply needing a few extra players for our own raid. The Allies of Light are made up of FIVE long standing and strong kinships so as you can gather help or advice should you need it is never far away. Do we interest you? Here is who you should know. Generally one of the above is nearly always online in game so feel free to drop any of them a tell for a invite or you could apply here on the site if you are interested in joining us.